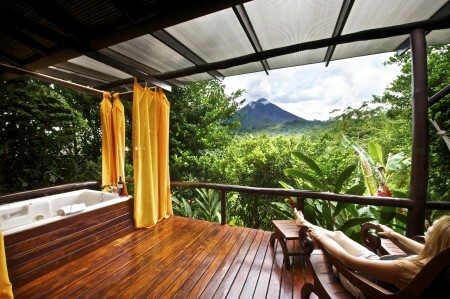 Nayara Hotel, Spa & Gardens is an award-winning resort in the heart of the Costa Rican jungle. It boasts 25 casitas (bungalows) and a spa with four treatment rooms (two of which are open-air massage bungalows), meditation trails, a fitness room, and a custom-made wooden Jacuzzi overlooking a small creek. Treatments employ local ingredients like coffee, aloe vera, and volcanic mud. A range of dining options include a sushi restaurant with a Latin flair, a bar with its own premium vodka dispensing system, and a dedicated wine and tapas bar. Nayara is the perfect base from which to explore the region through activities such as bike riding, zip lining, white water rafting, and hiking.